Writing is a calling that wasn’t always on the list of most recommended vocations, especially when the authors were at mercy of big publication houses. Poets had to have a “job-that-paid-bills”, and practice the writing in a corner of their study with a hope that some day their work will see the light of the day in form of a published book. But digital evolution has also revolutionized the way books are written and published these days. If you have a story to tell, there certainly is an audience in some corner of the world that would love to hear your story. Good, readable prose on the other hand, has always required creators who are acute observers of human nature, whether fiction or semi-fiction. In order to appeal to the readers, a story has to have a set of real, believable characters that breathe and talk and act like real people. Such books are often written by investigative journalists, world-travelers or authors who write for niche audiences based on their professional experience and extensive research of the field, e.g., Dominic Lapierre, James Michener, Bill Bryson, John Grisham, Frederic Forsyth, Ravi Subramanian, etc. Vikas Swarup, whose debut novel “Q & A” made a startling best-seller, belongs to the later set. Born in a family of lawyers, Vikas Swarup was educated in Allahabad, where he majored in psychology, history and philosophy, the very essential subjects that made a good story-teller. He joined Indian Foreign Services in 1986 and has worked in Turkey, USA, Ethiopia, UK, South Africa and Japan. Just imagine the wide variety of cultural experiences that such work would involve – leading to a matured, realistic view of complexities of the world. This can be seen in his characters that grow-up in a multi-religious, multi-linguistic sets and blending identities. But, we will talk about his books in detail in some of the future posts. 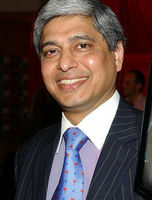 So far, Vikas Swarup has published three novels i.e., “Q & A“, “Six Suspects” and “The Accidental Apprentice“. He also contributed to a children’s charity by providing a short story called ‘A Great Event’ that was published in “The Children’s hours: Stories of Childhood”. He received an honorary doctorate by the University of South Africa in 2010, and he continues his diplomatic career in the capacity of the new official spokesperson for the ministry of external affairs of India, where he heads the public diplomacy division. Well, you may have a question that why we wrote this small article? Well, we had bee through some of his literary works, and we are planning a series of articles about the same. So we felt that it would be interesting for you to know the man behind the works. And yes, this way you also have a brief idea of what is coming your way from ThinkerViews. Do let us know your thoughts about this article and planning. Is there anything specific you like us to cover in the coming up articles? We always love to hear you.